See the SmogDay website for the real human stories behind the statistics on pollution. In December 2015, pollution causing smogs in Delhi gave it the worst air quality of any city in the world. It was exactly 63 years since the ‘Great Smog’ of London, estimated to have killed up to 12,000 people, which led to the UK’s groundbreaking Clean Air Act of 1956. 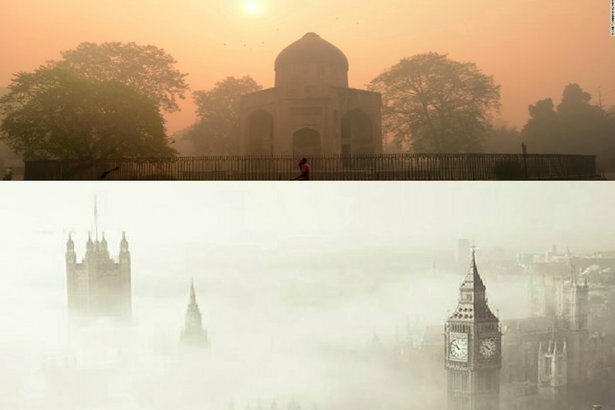 Each winter, these two cities are connected in what has become a global ‘season of smog’. In Delhi, this spikes with Diwali in November. On 5 November 2016, particulate levels in Delhi were 14 times the standard for safe, breathable air, and worse than levels during the great London smog of 1952. In spite of many differences, London and Delhi have become ‘toxic twins’. Their challenge is to become ‘clean air cousins’. For many it is hard to imagine what that might look like. But our project – Clearing the Air – drawing on the experiences and visions of citizens in the two cities will help make that brighter future clearer to see. In December 2017 (see below) we will inaugurate an annual day to remember those who die prematurely due to avoidable air pollution, and to promote ambitious, necessary solutions to the problem. The relationship between pollution and our bodies is a complex one. Air pollution increases our risk of getting lung cancer and it’s bad for our heart and blood vessels. There’s a strong link between poor air quality and asthma, and evidence that all the organs in our bodies are affected by it in some way. The mess we’re in doesn’t respect borders or different stages of economic development. From London to New Delhi we’re still not creating cities where the air is fit for us all to breathe. It’s a stark example of a much bigger problem. A rapid transition to make cities free from toxic air pollution, much of which results from fossil fuel use, is also a key step towards a zero-carbon economy. This is about how everyone, globally, can thrive within planetary boundaries. Shifting to 100 percent renewable energy by 2050 would prevent a staggering 90 million premature deaths between now and then according to work by Mark Jacobson at Stanford University. To understand the problem from a local, human perspective, the New Weather Institute is talking to people in London and New Delhi living parallel lives in terms of their collective struggle with air pollution. Together, we are building a picture of the many, avoidable, impacts it has on the young and old, those who have no choice but to work in polluted air, and right across society. But we will also be growing visions from the day-to-day experiences of those living on the urban pollution front line. We believe these will help us all see a better, cleaner future, and accelerate our clean air transition. We launched the project on the UK’s first National Clean Air Day, with events and films to educate people about the problems – and to build towards the solutions we so badly need. So, is cleaner air just the result of conventional economic development and a country becoming wealthier? Apparently not. In 2016, decades after London, one of the world’s richest cities, was meant to have cleared its air, the High Court in the United Kingdom ruled that plans to tackle poor air quality were still “woefully inadequate”, and the country as a whole in 2017 was struggling to meet EU air quality regulations. Burning fossil fuels lies at the root of both life-limiting smogs and the build-up of climate disrupting greenhouse gases. London and Delhi are both plagued by severe pollution and are, currently, heavily dependent on fossil fuels. But the problems are not new. London’s fight against pollution began as early as the 13th century when laws were passed to protect citizens. It reached a climax with the smogs of the 1950s and the passage of the 1956 Clean Air Act. Now dirty diesel is the problem, contributing to nearly 10,000 deaths a year. Although the city is committed to becoming zero-carbon by 2050, a clear road-map is lacking on how to make the promise a reality. Every day of delay in tackling the problem globally consigns thousands of people to premature deaths. For that reason, the project is also going to create a day of remembrance for all those people avoidably lost to toxic air pollution and as a moment to look ahead with greater commitment to solve the problem. That day will be on 5th of December, the anniversary of the first day of the Great Smog of London, 1952, and a time of year when lethal smogs have become common in Delhi. We would love to hear any comments and ideas this project might trigger for you, which can be left on this page. I took the liberty of reading your blog after spending our time on the train yesterday. I also looked at a large number of your Instagram photos! Both actions, along with our conversation with yourself, Rachel, and Scarlett Iona, caused me to write to you on this blog comment. I am one of many who have no idea of the extensive damage poor air quality causes even though I often feel my own body responding negatively. I have visited Delhi and the constant stench of “something burning” became acceptable after a while but always hung in my mind. Here in London, on this my first trip, I haven’t noticed poor air quality all that much, but upon listening to my cab driver last night telling me about the goal of having non fuel burning cars by 2040 and the heavy promotion of bike travel the message is reaching the masses (I always feel cab drivers know the most!). All this adds up to me wanting to help. I am a very experienced filmmaker who would love nothing more than volunteer my time to this extremely worthy cause. I have made feature films, and I have also done documentary. I conceived and directed a fund raising film for “Caring for Cambodia” an NGO that builds schools in Cambodia. It is titled “Promise” and can be found on YouTube. There are others but that one seems the closest example of what you may be looking for? As I mentioned, I will be re-locating to Ajman in September and that is a stones throw from Delhi (well not really but it is not that long a flight).